Whenever you post an existential question to Twitter, it isn't likely that anyone -- let alone a fast-casual restaurant -- will come to your aid bearing actual wisdom. On the contrary, some establishments will be sure to heap scorn and ridicule on you for publicly airing your problems. But not Chili's. For some reason, people have been tweeting their dilemmas at the restaurant's verified account on Thursday, searching for meaning and clarity in this cruel, unforgiving world. Chili's has answered the call with a surprising degree of insight and emotional depth. It's not as bad as it seems. While at times life can feel overwhelming, there's always more good than bad. You simply have to look for it. If your deductible hasn't been met, your copay is how much it costs to simply leave your doctor's office. They can charge way more later. Chili's mastery of the healthcare question confirmed its new reputation as a wellspring of good advice. Therefore, people are wondering how they drifted through life without knowing this. There are some things even we can't answer. If Wendy's is the evil contrarian of fast-food Twitter, then Chili's is its wise and angelic stepsister. Let's just hope for the sake of constructive discourse that the two never meet in a darkened alley. 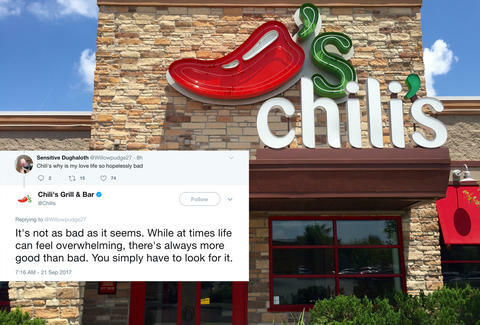 After all, people will inevitably need more advice, and Chili's will need to be there to save the day. Otherwise, the consequences might be dire.